The SC Big Trouble is the smaller brother of the SC Power Pak, made 1 year prior. 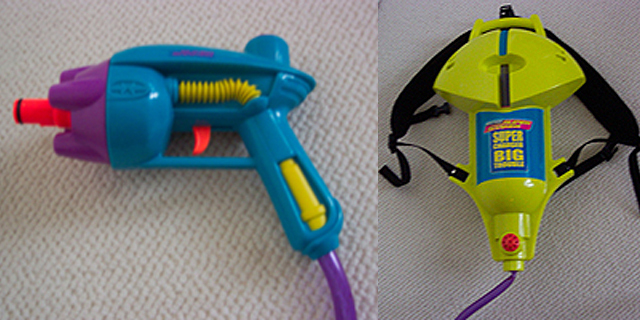 Like the Power Pak, the Big Trouble is a QFD-only gun, with no pump or reservoir included. The CPS chamber is held in the backpack and is rather large, giving the gun an excellent shot time (mostly making up for the lack of a pump/reservoir). The Big Trouble has 4 nozzles, 1.5x, 8.5x, fan, and a "Power Burst" nozzle, although it's probably the weakest of all of them. The Fan, 1.5x, and "Power Burst" settings last quite long. The 8.5x blast lasts about as long as a low-output blast on other soakers, and has excellent soakage. The only problem is that the check valve on top of the pistol shoots water out when you let go of the trigger after an 8.5x shot. If you're not careful, this can get you wet. Too much of this in a 1HK game is suicide (literally). Also, since the gun IS QFD-dependent, it's not a good gun if you're going to be far off with out a "hard line" (had to get a Matrix quote in there somewhere) or someone with a portable QFD, there's absolutely no way to refill. One other quick note - the pressure gauge is on the BACK OF THE BACKPACK! No offense to Hasbro/Larami, but what kind of idiot would put a gauge on a soaker where you can't see it? Thankfully, you can hear a certain noise in the QFD when it starts to get full - otherwise the aforementioned check valve would get water all over you. Still, overall, the SC Big Trouble comes in high recommendation from myself.